Law School: Duke University, J.D. Member: Baltimore County, Maryland State and American Bar Associations; Maryland Trial Lawyers Association (President, 2003-2004); National Organization of Social Security Claimants’ Representatives. 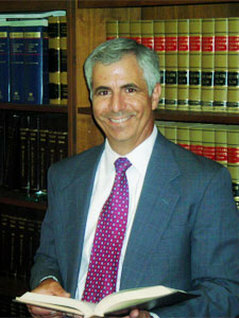 Mitch Lambros attended Duke University for college and law school (B.A., 1982; J.D., 1985). He is a member of the Phi Beta Kappa honorary society for academic achievement in college, and also a member of the Order of the Coif for academic achievement in law school. Mitch has been in practice in Maryland since 1985. He has received Martindale Hubbell’s highest rating (AV) for legal ability and ethics. For more information on this rating, please click here. Mitch was president of the Maryland Trial Lawyers’ Association in 2003-2004. During that year, through the tireless efforts of an excellent team, MTLA beat back a massive attempt to take away Marylanders’ legal rights in medical malpractice cases. Mitch remains active on the MTLA Board of Governors and has served on the board since 1994. He has chaired MTLA’s fundraising and legislative committees and served as editor of its quarterly publication, Trial Reporter. Mitch Lambros practices exclusively on behalf of plaintiffs in injury and disability matters. His practice areas include personal injury, automobile negligence, medical malpractice, workers’ compensation, and Social Security disability. He has extensive litigation experience in complex personal injury and medical malpractice cases in Maryland state and federal courts. He also has litigated medical malpractice cases in the District of Columbia and Pennsylvania. He has represented Social Security clients in hearings before Administrative law Judges over a thousand times.